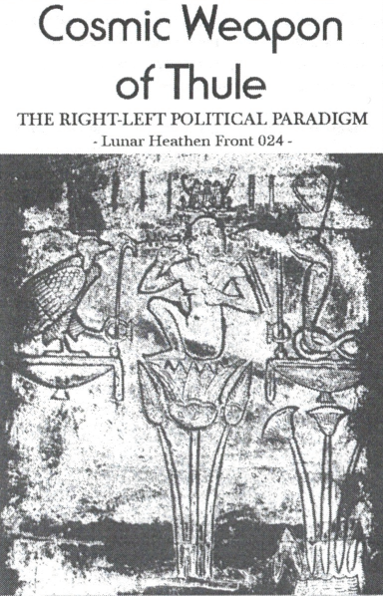 Home > Tapes > Cosmic Weapon Of Thule "The Right-Left Political Paradigm"
With the recent doxing of a metal-archives administrator as a leftist activist and people devolving eagerly into complete autism over selfies between people of old Polish BM scene, it would seem in-depth commentary on this subject is required. The “Right” & “Left” are the two beasts foretold in the Book of Revelations and as the written essay within the insert outlines, because of these things end of the human race is coming fast. While unfortunate, it is suspected that the content discussed here will go over the heads of most people, which is fine as only a select few shall be able to ascend into the Atlantean godhead and these materials are only for those peoples. Cosmic Weapon Of Thule plays NS Techno propaganda exclusively without compromise and this material is a return to the longer song structures of the NS Techno & Aryan Unity albums while still keeping the neo-classical experimentation that began on the Keku-Semau album. Currently this recording is only going to be made available as a cassette tape until a more affordable means to produce these materials in CD/CDr format with 8 page booklet can be found.